The Seltorians were genetically-engineered by the Tholians to be their primary servant race in the M81 Galaxy. Since loyalty to the Tholian Will was designed into their very genes, they could be trusted to operate armed starships and crush whatever rebellions or pirates disturbed the peace of mind and sense of order of the Tholian overlords. The Seltorians were given a weapon called the shield cracker by the Tholians. This weapon knocked down the shields of rebellious or pirate ships and bases, allowing the Seltorians to swarm aboard to destroy any opposition. 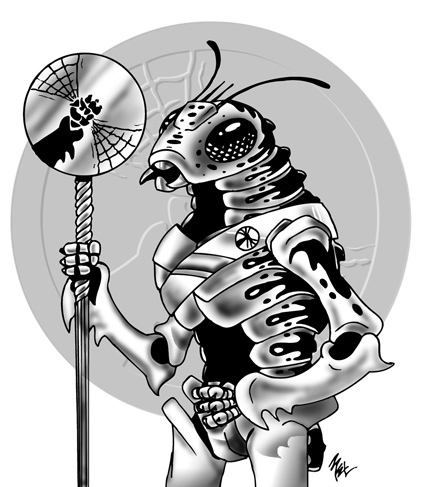 Seltorians are six-foot-tall insects. The Queens can (if given enough food) lay millions of eggs, quickly raising new warriors. Seltorians become adults in six months, and die in five years. They have no concept of "sacrifice" because for them (and the Tholians), life is cheap. Most Seltorians are female workers; one in ten thousand females does not die of old age but metamorphoses into a nearly-immortal "expert" who become technicians. The few males are born as Rams, and any Ram who mates with a queen (needed to produce fertile eggs) dies. Those who never mate metamorphose into Sages, nearly immortal officers who run the Seltorian military and society. Unfortunately for the Tholians, the loyalty genes eventually broke down, and the Seltorians revolted against their Tholian masters. The shield cracker was developed into the web breaker, which not only disabled the primary Tholian weapons, but caused the hollow planets Tholians built to live in to collapse. Alone in the known universe, the Seltorians were capable of killing billions upon billions of sentient beings in one campaign of destruction. No exploration of the Star Fleet Universe would be complete without starships. We offer a full range of pewter starships in 1/3788 scale (most are two or three inches long) both as individual ships and in	Squadron Boxes of five ships. Photos are also available to view samples of these pewter miniatures.